Well I’m finally getting around to it. I’ve had some seed catalogues for awhile now and I’ve been procrastinating about ordering seeds from them, but I think it’s time I get to work and do it. 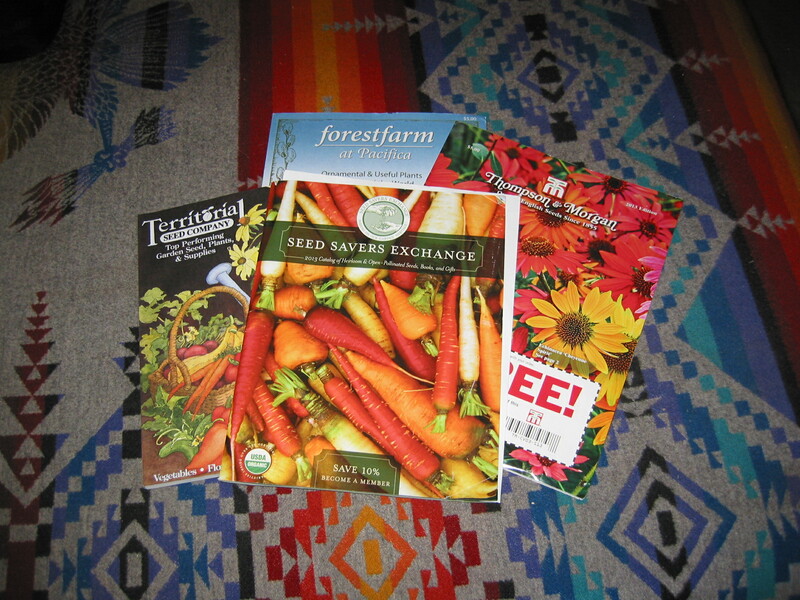 I’ve decided to mostly try to go for heirlooms this year since I had such good luck with some last time around so I’m focusing mostly on one catalogue – the Seed Savers Exchange. The Seed Saver’s Exchange is a unique and remarkable entity. They encourage the saving of open pollinated heirloom seeds from all over the world in an effort to maintain the genetic diversity of our plant life. You may know this but if you don’t you should. Our genetic pool is dwindling precariously as more scientists plan more genetically modified and patented seeds. Now a farmer often can’t save their own seeds and has to buy new ones every year from the seed supplier because of patents and protections. It’s a dumb thing to do. And terrible for 3rd World farmers who should be saving their seed for money’s sake but instead are forced to buy from their suppliers. It’s a scam of monstrous proportions. We only have a few varieties of many of the major plants we rely on for food. One is corn. We generally use only a couple of varieties of corn for all those thousands of acres of it plants all over the country. It would be a calamity if some scourge attacked the crops and we had nothing to fall back on. That’s where Seed Savers comes in. They have genetic stock of all sorts of old style varieties that still bear really well and are open pollinated and non patented so you can grow your food and save your own seeds, thus making the plants stronger and more adapted to your climate every year. I haven’t gotten into that much yet tho I’ve been saving some seed for years. But mostly flowers. Now I’m going to try saving my veggie seed as well. I’ve been going thru the Seed Savers catalogue and have found a plethora of wonderful plants that sound just so yummy to eat that I’m barely into the booklet and already I have more than I’ll probably plant. But I want to try some things in the greenhouse again this yer so I have to order some things soon so I have a chance for growing them before I get to the real work of the outer garden. I want to plant some old fashion zinnias this year. They were my grandmothers favorites and I try to grow them every year but haven’t for a year or two. So this year I’m getting some special red ones that have been around since the 1800’s sometime. They’ll make a great border for the fr0nt of the yard where the street is. I have Oregon grape and nandina as a back drop next to the Thuja pyrimidalis and it will look so pretty with the red zinnias all across it. I’ve found several other flowers that I want to plant too. But mostly now I’m focusing on veggies. I’ve got an Early Bird Turnip Beet that grows a huge red beet that will have lovely greens to munch on in the interim while I wait for the beets to grow. They talk in the catalogue about baking beets and carrots for the best flavors. I haven’t tried this yet but I intend to. I do it with yams all the time and they turn out so well. I’m sure the beets will do just as well. I’ve also picked out a couple of varieties of carrots – a Nantes variety for keeping since they do it so well and an Oxheart for the same but I also picked out one called Dragon for it’s red skin that just looks so delicious I had to try it. I love root crops tho they aren’t always easy to grow for me. I’m still somewhat of a novice to veggie gardens as I haven’t had a place for it for too long but I do remember some things. And carrots do well for us so it makes sense to want a lot of them. They keep well. I love eggplant and have had good luck with the Japanese variety in the greenhouse a year ago so I’m going to try some again. It’s a different variety and has a longer fruit so I hope they make it in time. I figure I’ll start the seeds of them now since they’ll always be in a sheltered place and that way I can increase the growing season. I’ve done tomatoes and peppers in the greenhouse the last two years and had mixed results. The first year I got a tomato specifically for greenhouses and they did quite well. The peppers did wonderfully. I plan to grow more of them this year but haven’t decided on which varieties I should try yet. I ate the ones I liked and didn’t save seeds, darn it, so will have to start new, but there are so many types to try. I’ll do OK I’m sure. I love the possibilities with all the peppers. And of course I like the hot ones the best. Ah well. I couldn’t get by without greens and I intend to grow my usual Bok Choy, using one of the Seed Saver special varieties. I also want to try some Tatsoi which is an Asian green that looks to be quite tasty and has a rosette of rounded leaves and will form a nice head. I tend to just pick the bok choy as I need it and let the plants keep on growing rather than try for heads like the markets do. Maybe I’ll see if I can get some to head up this year, just for a change. And of course I have some Red Russian Kale which looks to be beautiful and will last thru the winter and only get sweeter as it tends to do when it chills. Kale is so full of good stuff and it lasts so well in the garden it’s always nice to have fresh greens in the depths of winter and we enjoy it immensely. This variety it so lovely with its red veins and light green leaves, so different from regular kale with its darkness and full bodied leaves. These look like they’d be delicious. I have so much more work to do still. I have to finish going thru the catalogue and finding out everything I’d Like to grow and then I have to get real and narrow it down to what’s likely for me to be Able to grow and come to a happy compromise. I’ll stil buy too many seeds I’m sure. I always do but then they do last for some time usually and I do keep them. In fact I still have some good seeds left but I may just do the heirlooms this year and see how they do. It’s exciting to feel yourself a part of a movement to reclaim our horticultural heritage. I’m a member of the Seed Savers Exchange and get a discount on my purchases but if not I’d buy from them without the discount. I think they do such good work. Such essential work. I hope some of you decide to try to find them. You can Google them I suspect but I’ll give an address just in case. They’re at: Seed Saver’s Exchange, 3094 N. Winn Road, Decorah, IA, 52101. Look them up and check them out. You may find a whole new world of seeds to try! I think ferns are one of the loveliest parts of a garden. I have a whole bed of them as well as some stuck in here and there to give that airy, lacy effect they’re so famous for. I love the ones that stay green all winter so I can enjoy them but I also appreciate the ones who go dormant and lose all their leaves and just wait for spring to come forth again as they all do with their new growth. I’ve tried to capture the spirit of each plant here both for my own records but also to share with others. I hope you enjoy this fern tour. The first fern on this tour is an Alaska Fern, or Polystichum setiferum. It grows about 2-3 feet around and stays green all winter. I have a couple of these because I like them so much. Next to it is an Autumn Fern, Dryopteris erythrosora, which comes on with new growth that is bronze in color tho it’s not in autumn that it does this so I’m uncertain about why it was named this. It’ll all stay evergreen and gets about 2-3 feet big. Next is a Japanese Tassel fern, another Polystichum, polyblepharum. Smaller than the others but still evergreen. Here’s a ratty looking specimen of our native Sword fern, Polystichum munitum. It’s in winter since I couldn’t find another picture of it in spring or summer. It will get 5-6 feet tall and is a staple of NW gardens and hillsides. Beside it is a Long Eared Holly fern or Polystichum neoloblatum. Not too big a grower but evergreen. Then another Holly fern, this time a Cyrtomium falcatum. It looks a little more like Holly but both have scratchy scales on them so both are aptly named. I think this is a native Lady Fern, Athyrium filix-femina, but I’m not sure. We transplanted it from a part of the garden where it had naturalized. It didn’t do so well here so I took it out but still wanted to show it off as it’s really something. We still have some of them coming up here and there all over the garden. They look so sweet when they’re young and small but they do get huge and I don’t have many places I can accommodate them so I pull most of them and let a few survive for awhile. They’re deciduous so disappear completely in the fall. Here’s a Licorice fern, Polypodium glycyrrhiza, another NW native whose roots have a licorice like flavor and were used for that by the Native People. It’s another evergreen. Next is one of the 2 plants in the garden I lost the sticker from. It’s an unknown fern but may be a male fern, Athyrium filix mas, or may not be. I dunno really but it’s pretty and stays evergreen all year so it’s nice to have where it is. Then there’s a Dragon Tail fern, Asplenium ebenoides, that is supposed to look like a dragons tail. I have a hard time telling it from the Deer fern but they’re not related apparently so I don’t know why. Ferns are like that tho. They often look similar. Here’s another Alaska fern, or soft shield fern, Polystichum setiferum, here, as I said, because I like it so much. And next to it is a variety of it called “diversilobum” for the way it grows into something of a stalk as it gets bigger. It hasn’t done that yet for me. This next one will get to be about 5-6 feet tall which is why it’s tucked back in the corner of the yard. It also loses its leaves so I have to put in a stake so I don’t forget it. It’s a Purple Stemmed Royal Fern, Osmunda regalis var. regalis Purpurascens”, and has purple stems on it’s lovely stalks and interesting leaves. I can’t wait for this one to get big! This an Auriculate Lady Fern, Athyrium otophorum, and is another deciduous one. It’s one of the parents to the Ghost fern you see later on in this pictorial. Beside it is a clump of what will become a large fern 5-6 feet tall. The Giant Chain Fern, Woodwardia fimbriata, native to the Sierras of California and parts of Oregon. I got these in tubes just a year or so ago and they’ve really grown a lot in that short time but still have a long way to go. They’ll get there in time. The last row starts with a Japanese Painted Fern, Athyrium nipponicum “Pictum”, another unusual deciduous fern from Japan that has won numerous awards of merit for its unique coloring. It’s the other parent of the Ghost fern next in line. The Ghost fern, Athyrium x Ghost, is a cross between the Auriculate Lady Fern and the Japanese Painted Fern and has characteristics of both. It seems to get bigger sooner than either of its parents and has wonderful under-lighting qualities to it. Last is the Deer fern, Blechnum spicant, another NW native. It puts up sterile fronds in the top of the plant in spring and keeps the basal leaves all year round. So that’s the tour. I didn’t realize I have quite so many of these things. I know there are still a couple more I missed but you got the majority of them. As you can see they do give a certain quality of grace to the garden and harmonize well with their surroundings and the plants with them. They go well with all sort of things especially my faves, the Ercicaceae. They make the garden more interesting and give it a certain quality of light and delicacy that nothing else quite does. I hope you’ve enjoyed this tour and come back for more when you can. This time of year is always hard for me as a gardener. Things are dormant now and it’s a bit too early for most of them to be putting out new energy. It’s a time of resting and preparation and a time to be aware of both the endurance and the impermanence of the garden. It’s a time for reflection on what has been, what is, and what will be in time. When I walk thru the garden now I see mostly the evergreens that stay with us all year round, sometimes in their winter colors and some their usual greens of varying hues. What I also notice are all the bare stems and especially the places where there is nothing growing at all. It’s those places that intrigue me right now in this interim time. I can remember so well what the plants looked like and in some cases I purposefully don’t clean up the dead fern fronds or the last of the poppies for awhile so I can recall them in their glory. It reminds me that they were there and they will come back. There’s something about a blank spot in the garden that bothers me. I feel like the plants are missing and it feels like loss to me. Loss is a big part of gardening. You have to deal with it every year when the “season of falling off and dying” passes us in the fall and we come to the winter of bleak prospects. There really isn’t a lot going on now tho there is still plenty to see, as I talked about in my last post. But loss is the big theme for me right now. I think it happens to me every time this time of year. It just goes with the season. And it’s not a bad thing either. It’s just what it is in the cycle of life. But it’s something you can feel full force in the garden. Things are just gone and we don’t know for sure they’re coming back again. We have to hope they will. I have a lot of evergreens of all sorts, and they comprise the majority of plants in the garden. I imagine it’s true for most people. They’re the ones who hold the place together and provide us with a sense that the garden endures and that things will be once again as they were in the past. They allow us to keep going on and not feel the loss of the others so much. But it’s still there. Even the evergreens lose some leaves now in the winter. The deciduous trees and shrubs are special to me in a different way. They give me 4 seasons of beauty and this is the most subtle time to comprehend them. The time when there’s nothing there but stems and buds and the leaves are long gone and on the ground decaying into compost for next year’s growth. They show themselves fully to us at this time of year. I love seeing the way they are shaped right now. You can really see it in the habits of the plants that are deciduous in a way you never can see the structure of the evergreens unless you do a lot of interior pruning which I don’t really do much of. Tho I could and will do more in time as the plants grow. I like to see the shapes of things. To see their bare bone structures and how they grow into such amazingly different forms and styles. There are so many ways for a plant to manifest its being and I appreciate them all. Of course we see this in the evergreens as well. Their shapes are more permanent in the landscape and they always look more or less the same except when they put on their bursts of growth in the spring. That’s an exciting time and it won’t be that long till it’s upon us again. But not for awhile yet. We still have a lot of winter to get thru first. All of this transition time. It’ll take awhile and we might as well enjoy it. We’re on the cusp of the new season now. I see the buds growing on some plants and my Lenten Rose is almost in bloom now and so is the Himalayan Sweet Box and the Winter Daphne. It won’t be long till there are actual flowers in the garden again after this time of other sights to see. There’s so much more to a garden than flowers, tho I think that’s why most people garden. Of course we all love flowers. But in Asia they have styles of gardening that emphasize the shapes of things and I’ve come to really appreciate that perspective. This is what we see now most of all. The shapes are dominant in the landscape, not the colors of the pretty flowers. This is what we see now in our own gardens. We see the shapes of the various plants, from the strong uprights of the yews and pyramidalis cypresses to the rounded balls of the dwarf firs and cryptomerias, to the cones of the Alberta spruce and the upward sweeps of the Hinoki cypress. 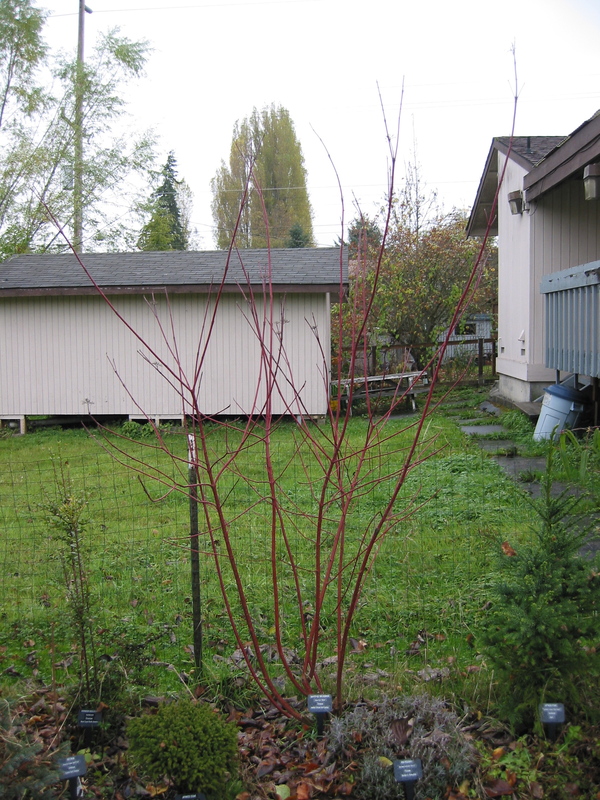 Also the rounded balls of the many deciduous shrubs like the creek dogwood that is upright but still round tho it’s bare as can be. And the “sticks” of so many plants that look like nothing more than stakes in the ground to some people. But to me they are potential. That word more than any other may sum up this time of year, this transition time. It’s a time of potential, waiting in the ground to burst forth again in the spring with all its magnificence. It’s there in the plants and in the herbs in the ground. It’s in the buds of the evergreens and conifers, in the flower buds of the Pieris and the Mahonias. It’s everywhere and it’s not to be denied. It’ll take over soon and we’ll all be thru this transition time of waiting for things to happen. So for me it’s a time to just enjoy what we have and appreciate this latent potential awaiting us soon enough. We wouldn’t really appreciate it as much if we had it all the time I suspect, but I speak as a northern gardener and it’s much different in the tropics I suspect. I can’t imagine that prospect and even here in Seattle we have a short winter by comparison with other places in the North. It’s really a brief time to appreciate all this transitioning and waiting and just being with the garden in all its phases. This part of gardening – to be with it all the time in every moment if we can, and just see and comprehend what we’re seeing. To listen to the birds sing and the cracking of the ice in the fountain. To Be Here Now in the moment of time right where you are and how you are and everything about the garden and its appropriateness. This is the Magic of Gardening. The garden is never out of tune with itself unless we make it so. We’re the ones who get out of tune with the garden. This is the time when we can go within and let ourselves just let go and tune into the energy of transition and marvel at it.